One of the most exciting trends in downtown Nashville has been the conversion of stodgy old office buildings into hip new boutique hotels. While some of them still may look a little boxy on the outside, step into the lobby to discover a world a luxury replete with top-notch amenities, great restaurants and cool cocktail bars. Here’s a handful of the best. Only open for about a year and a half, 21C is already the dean of this generation of new downtown lodging options. The entire building actually is a museum, open 24 hours for anyone to come visit rooms and hallways filled with edgy modern art. 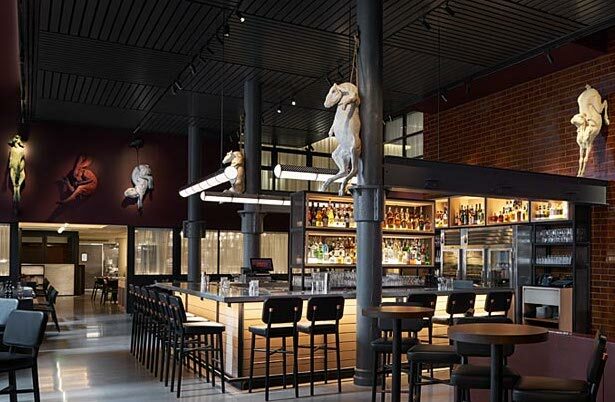 After a little gallery time, stop in at Gray & Dudley for an artfully crafted cocktail under the watchful eyes of some slightly (ok, extremely) creepy gargoylesque figures of wolves, rabbits and lambs staring down from the walls. Even better, make a reservation at G&D’s restaurant for some of noted chef Rob Newton’s food that combines his Arkansas roots with his fascination with Asian cuisine. How does that combination manifest itself? Get any dish with rice in it and you won’t be disappointed! First of all, it’s not “The Bobby,” just Bobby–they want you to be on a first-name basis with this luxury lifestyle hotel. Eating and drinking options at Bobby are casual, but that doesn’t mean they are ordinary. 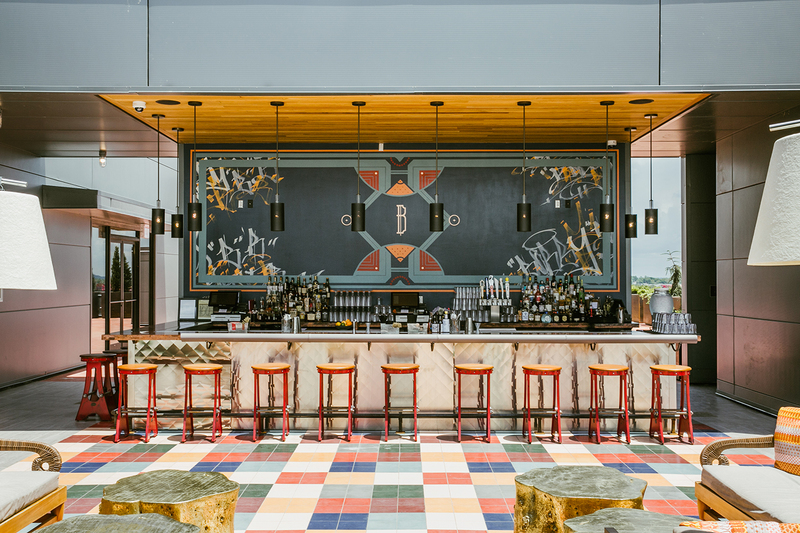 From a cozy sidewalk cafe to the gritty car-themed Garage Bar to the internationally-inspired Bobby’s Tavern, the ground floor of the hotel offers excellent choices for your dining pleasure. For the real highlight, though, head to the rooftop where there’s a slick pool lounge and an actual 1956 Greyhound bus that has been refurbished and placed on the roof by crane to create a unique spot to enjoy a cocktail. Noelle is actually a member of Marriott’s line of boutique hotels that they call their Tribute Portfolio. Featuring comfortable king-sized beds in every room and four huge suites on the top floor, Noelle is aimed at both leisure and business travelers. Drug Store Coffee features beans courtesy of local favorite Barista Parlor while Makeready Libations & Liberation aims to free your mind with a menu of American classics in a gastropub setting. Head to the Trade Room lounge for a drink in classy environs surrounded by terrazzo floors and marble walls. 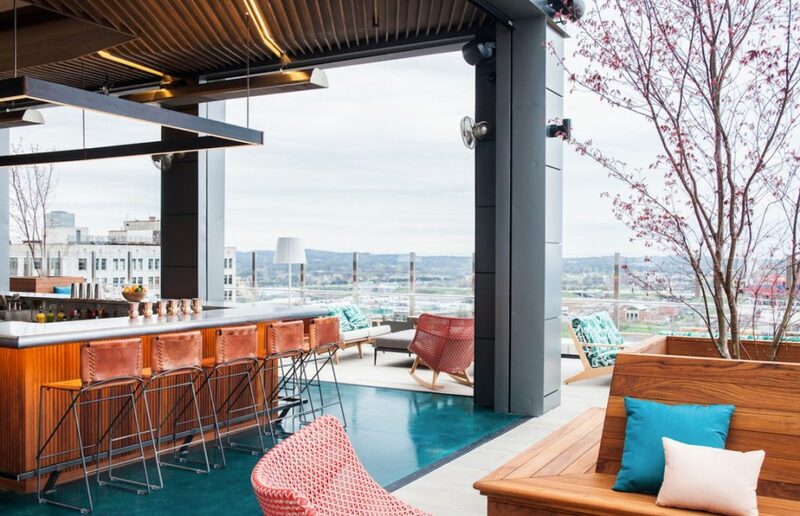 Noelle also has a rooftop lounge, because apparently that’s the law in downtown Nashville now, but it’s a pretty special one. Rare Bird is truly a year-round destination thanks to overhead heaters and weighted blankets to keep you and your sweetie warm while you snuggle. Holston House is also part of a national chain, in this case the Hyatt group of hotels. 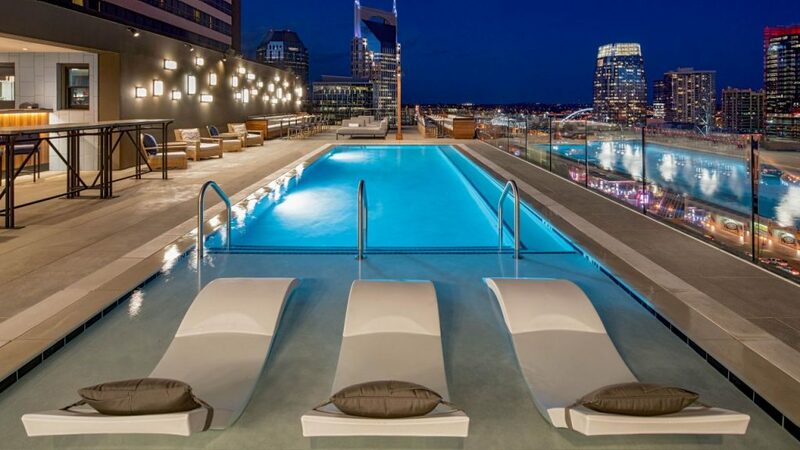 Even in a city filled with rooftop aeries, the pool deck at Holston House stands out. Offering sweeping views of the downtown craziness below, TENN on Top is a calm oasis of peace, at least until it’s party time. Then, the bands get pumping and the deep menu of top-shelf bourbons starts flowing to create a festive atmosphere. Holston House continues their naming theme with their Southern-inspired restaurant TENN and the accompanying Bar TENN in the lobby. Even if the names aren’t that imaginative, the food and drink surely are. The Fairlane Hotel still exudes the vibe of the former bank building it used to be, but management takes that theme and rolls with it. The coffee shop recalls the former building tenants with its name of Union Teller, but the Stumptown java is much better than any lobby coffee you would have found in the urn of the bank back in the past century. Mile End Delicatessen is evocative of a Montreal-style or New York deli thanks to delicious sandwiches piled high with sliced meats and bagels topped with a schmear of decadent cream cheese and imported smoked salmon. Ellington’s is the signature restaurant on the upper floor which used to be the executive dining room for the bank bigwigs. 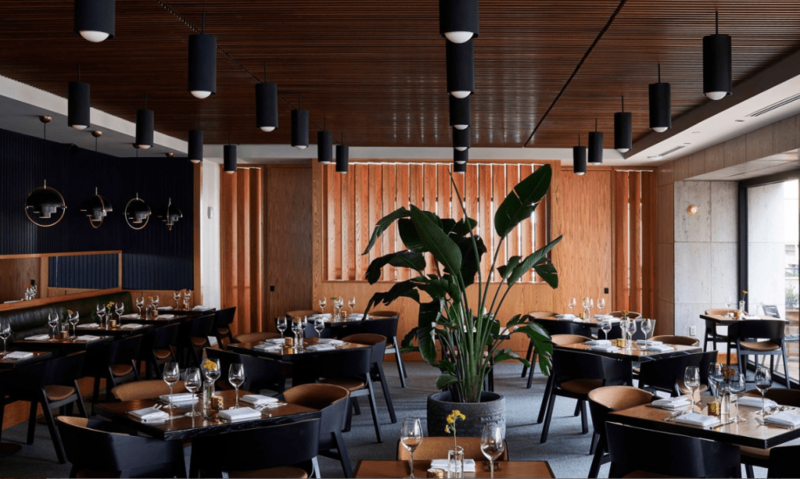 Now the rest of us can enjoy their menu of elevated Southern classics in an attractive mid century modern decor or on the festive outdoor terrace.